Super Mario Party is a game in the Mario Party series, released for the Nintendo Switch on October 5, 2018. 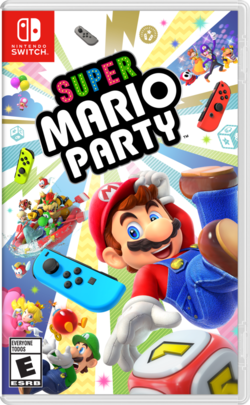 It is the eleventh home console installment in the series, as well as the first home console Mario Party game to not be a numbered installment since the original Mario Party game. Described by Nintendo as a "complete relaunch" and "complete refresh" of the Mario Party series when revealed at E3 2018, the game "goes back to the four-player basics as you take turns and race across the board searching for Stars" as seen in the Mario Party installments prior to Mario Party 9, but also incorporates elements from the more contemporary Mario Party games, including the "ally" mechanics from Mario Party: Star Rush. Additionally, the game takes advantage of Nintendo Switch hardware for its minigames, such as flicking the Joy-Con as if it were a frying pan handle. Players can even link multiple Nintendo Switch consoles together for a single, larger alteration of the display for the game. The game is the first installment in the Mario Party franchise to incorporate online play, as minigames can be played online. Mario, Luigi, Peach, Daisy, Wario, Waluigi, Yoshi, Rosalina, Donkey Kong, Diddy Kong, Toad, and Toadette are standing around, with each of the playable characters claiming that they should be the "Super Star". Mario suggests that they have a party to determine who the "Super Star" will be, which the group agrees to, with Toad and Toadette being judges. Suddenly, Bowser appears with Bowser Jr., Goomba, Boo, Koopa Troopa, Hammer Bro, Shy Guy, Monty Mole, Pom Pom, and Dry Bones, and says that he or one of his minions could also be the "Super Star". To ensure that the judging is "fair" and "impartial", he summons Kamek to judge alongside Toad and Toadette. Kamek then creates a venue for the party. When all the boards in Mario Party mode are completed, the Gem of Tenacity is awarded. Similarly, the Gem of Spirit is awarded when the Hard difficulty in Sound Stage is completed; the Gem of Courage is awarded upon sailing every branch in River Survival; when all the stages in Partner Party are cleared, the Gem of Love is awarded; and when every Challenge Road stage is cleared, the Gem of Passion is awarded. When all five gems are collected, they fuse together to create the victory podium, which the newly crowned "Super Star" stands on. The partygoers, even including Bowser or Bowser Jr., agree to get along, at least until the "next party". Mario's turn, prior to rolling the Dice Block, in the Mario Party mode. Super Mario Party reverts to the traditional way of playing Mario Party, where four players take turns to navigate around a linear board dictated by how much they have rolled through the Dice Block. When a character lands on a space, they receive effects dependent on what the space is, such as a Blue Space giving the player 3 coins while a Red Space subtracting 3 coins from the player. They can also spend coins to buy items from Flutter which can help them or hurt other players; these item shops can be triggered by passing by them in Mario Party or landing on them in Partner Party. The game borrows the ally mechanics from Mario Party: Star Rush where players can increase their team of characters by collecting party members who spawn throughout the board or by earning them by landing on Ally Spaces or using a Buddy Phone; allies gained from there are decided by a roulette. Allies contribute to Dice Rolls by either adding one or two to the total, and they participate in specially designated Team Minigames. Prior to starting the game, players roll a dice block to determine turn order. In Mario Party, higher turn orders determine who goes first, while in Partner Party, the team with the higher overall dice count goes first. 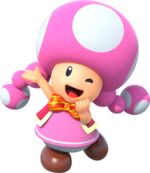 The overall goal of the game is to purchase the most Stars from Toadette, who serves as the host of the Star Space in this game. Stars cost 10 coins to buy, and after a player has purchased the Star, Toadette warps to another location of the board. In Mario Party, players can pass by Toadette to purchase Stars while players are required to land on the Star Space in order to receive Stars from Toadette. 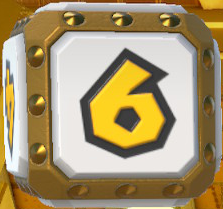 Super Mario Party introduces the choice of using character specific die prior to rolling, where players can either opt for the standard 1-6 Dice Block or the character's unique Dice Block, which carries pros and cons associated with it. If players receive allies, they have option to use their designated Dice Block instead. Additionally, partners contribute to the total Dice Block amount by hitting a weaker Dice Block with only 1 or 2 sides and adds up alongside the leader character's dice roll amount. Minigames are played, selected by a roulette, at the end of every turn, and the type of minigame is determined by the spaces players landed on. If all players land on the same-colored space as each other, a Free-for-all minigame is played. If one player lands on a different, non-green space than the rest of the players, a 1-vs-3 minigame is played, where players who land on the same-colored space are placed in the same team as each other. If players land on an equal amount of non-green spaces, a 2-vs-2 minigame is played, teamed up depending on the color; Team Minigames may be thrown into the mix, where the player's current allies may participate if they are received. If players land on a Green Space, the color is randomly determined to be either blue or red. Prior to playing the minigame, players view the rules and can practice; each minigame comes with its own rules and controls. Players can act out in the minigame's instruction menu prior to starting the minigame, replacing the practice feature altogether. Whichever player wins the minigame earns the most coins, while players who do not perform as well earn less coins. In Partner Party, Free-for-all, 2-vs-2, and Team Minigames are played; due to the mode having no colored spaces, all of those minigames show up in the Minigame Roulette. Minigame Star: Given to players who have won the most minigames. Rich Star: Given to players who have the most coins throughout the game. Eventful Star: Given to players who have landed on the most Event Spaces. Item Star: Given to players who have used the most items. Ally Star: Given to players who have the most allies. Buddy Star: Given to a player who has a particular, random ally. Sightseer Star: Given to players who have traveled the most spaces. Slowpoke Star: Given to players who have traveled the least spaces. Unlucky Star: Given to players who have landed on the most Red Spaces and Bad Luck Spaces. After this, the winner is announced, and players can then view the statistics of the player's progress through the game, such as a line graph detailing the Star collecting progress or how many times a particular space has been landed on. The game can only be played with a single Joy-Con per player, and is not compatible with the Pro Controller, unlike previous Mario games on the Switch. The game is also compatible with local wireless play. Players are first introduced to the Party Plaza, a hub where players can roam to various interest points, hosted by Toads of various colors. Players can explore the hub with a party of four characters, which serve as the characters participating for all modes. If players do not have enough human players, they are filled with a recommendation of a random selection of CPU players and their difficulty. Players can change their characters and CPU characters plus their difficulty by talking to Blue Toad at the gate of the Party Plaza. The initially available modes are accessed by walking up to the interest points and talking to the Toads who host them. Two modes are locked and are accessed through a Warp Pipe in the left and right areas of the Party Plaza. They are obstructed with a Piranha Plant and stun players who attempt to jump into it. After their unlock requirements are met, Kamek removes the Piranha Plant for the players. Players in the hub can access the Party Pad with , where they can quickly access different parts of the hub through a menu instead. The Party Pad also serves as a manual, where players can read descriptions for the various features in the game. Lastly, players can purchase stickers with earned Party Points and view their collected gems. amiibo functionality is accessed through the Party Pad, where scanned amiibo earns players shiny stickers for specific compatible amiibo and bonus Party Points for all other amiibo. A traditional four-player battle royale where each player competes for the most Stars, which are purchased from Toadette if players pay 10 coins. This mode uses the default ruleset described above, as players navigate through a linear board with many junctions and board specific features with Dice Blocks. Four boards are available, with one being unlockable. Unlike previous Mario Party titles, the only settings players can adjust for the boards are the amount of turns, from 10, 15, and 20 turns max (30 turns max on Kamek's Tantalizing Tower). Boards already beaten have their corresponding icons highlighted yellow, and players unlock Kamek's Tantalizing Tower if the available boards are all played on, and players earn the Gem of Tenacity if all boards in this mode are completed. Partner Party has two teams of two players all independently navigate around the same boards as in the Mario Party mode, except the boards have become nonlinear in a grid-like fashion, similar to Toad Scramble from Mario Party: Star Rush. The amount of turn options are the same as Mario Party, though players can select their team configuration prior to starting the match. 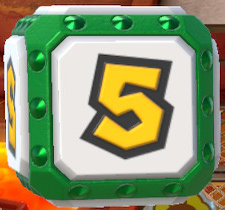 In this mode, teammates share their items, coins and stars, and, in a feature introduced in Super Mario Party, share their dice roll amount as well. Players can additionally collect allies on the board, though the ally's benefits occur only to the teammate who collected that ally. Partner Party has featureless spaces, in which nothing happens when a player lands on a blank space in favor of the removal of Blue and Red Spaces. Instead of passing by features such as Flutter shops and Star Spaces, players are required to land on those spaces to earn their benefits. Depending on the layout of the board, players have to roll precisely, such as rolling an even or an odd to land on the space or an exact amount for narrow dead-ends and corridors. Players can hi-five each other at the end of minigames to earn bonus coins, and the hi-five feature occurs whenever a positive event happens, such as starting the game or earning a Star. If two players land on the Star Space on the same turn, they both have a chance of obtaining a Star if they can afford it. Occurring during the middle of the match, Kamek adds hidden Bad Luck Spaces on the board that harm any player who unluckily lands on its space. On the last 3 turns, Kamek turns them into Extra Bad Luck Spaces hidden in the board. 1-vs-3 minigames do not occur in this mode, and due to the removal of Blue and Red spaces, available types of minigames are all featured in the Minigame Roulette, with Team Minigames being indicated by a special icon next to their name. In Free-for-all Minigames, the teammate who performs the best earns eight coins for their team, while the losing team earns two coins. In 2-vs-2 and Team Minigames, the team who wins the minigame earns eight coins (ten coins if they high-five), while the losing team earns two. If players complete all boards in Partner Party, they earn the Gem of Love. The beginning of the River Survival mode. A co-op-based mode where four players paddle an inflatable boat on a river filled with features and hazards to the finish before time runs out. Prior to setting up the game, players can select their configuration of their rowers in a clockwise manner. Players are then guided through a tutorial with Toad explaining the controls. After the game begins, players need to keep on track with the river while avoiding rocks and the sides of the river. Players can find balloons, which can be popped to play special Co-op minigames, where the four players need to work together to win the minigame. Depending on how well the players perform, they earn a rank based on their score, which then translates to extra time being rewarded. When players reach a junction, they can choose the path to go on; the preview of what the path is going to be like is indicated by their image on top. Depending on what path they choose, they can encounter more hazards, dash panels, ramps, and + Clocks to increase their time. Special characters can appear depending on the path chosen, such as a Koopa Paratroopa taking a snapshot of characters as they descend down the waterfall, to three boss enemies and their smaller variants being encountered, such as Mega Blooper, Mega Cheep Cheep, and Kamek himself (labeled as Mysterious Kraken, Mysterious Leviathan, and Mysterious Sorcerer respectively). If players complete River Survival on three paths, they unlock Donkey Kong as a playable character (on the time they unlock him, players can see him waving at the finish line). If players complete all branches of River Survival, they earn the Gem of Courage, in addition to a hard variation of River Survival being unlocked. A mode in which players play rhythm-based minigames back-to-back while trying to get the highest score. Characters use motion controls to stimulate the rhythms imposed by the minigames in this mode. Prior to playing minigames, players pump their fists to the rhythm as a tutorial before starting out on the minigames. The mode comes in three difficulties: Normal difficulty has players participating in three minigames, Remix difficulty has players participating in 6 minigames, where the last three minigames are sped up versions of the first three minigames, while Hard difficulty has a set of three more difficult rhythm minigames. When all three difficulties are beaten, the player is awarded with the Gem of Spirit. Playing very similarly to the various challenge gauntlets from previous entries such as Endurance Alley from Mario Party 6, Challenge Road is a one-player mode where the player plays a consecutive set of 80 minigames while trying to complete various challenges, such as earning a particular amount of points or finishing a minigame within a time limit. The mode becomes available when all minigames are unlocked. Players navigates through the minigames split up into six worlds: Shell Street, Chestnut Forest, Mushroom Beach, Ghostly Hollow, Salty Sea, and End of the Road. After players beat the final minigame involving Bowser's team on End of the Road, they are awarded with the Gem of Passion. Once the mode is cleared, a master variant of the challenges get unlocked, having tighter, more difficult requirements to complete. It has been requested that this section be rewritten and expanded to include more information (tagged on Toad, Toadette, Kamek and Custom Cups in Mariothon and Online Mariothon; Square Off gameplay). Play unlocked minigames and various other game modes. Mariothon: Compete in a cup tournament and win the most minigames. Square Off: Compete in a tile-based battle and capture territory by winning minigames. The online mode of the game, where players compete in five randomly selected minigames for a high score. Online leaderboards and a ranking system with rewards are confirmed. This mode takes advantage of the Nintendo Switch's local wireless features and the ability to create a multi-screen environment. Requires two Nintendo Switch consoles and two copies of the game for full experience. This mode allows players to apply stickers collected to an image. While in the entrance of the Party Plaza, players can adjust the number of systems or players. There are 20 playable characters in Super Mario Party, which is the largest number of playable characters thus far in the Mario Party series. Of these characters, 16 are available from the start, while the other 4 need to be unlocked. Goomba, Monty Mole, and Pom Pom are playable for the first time in the Mario Party series, with Pom Pom also making her overall Mario Party debut. Cheerful. Inspiring. Jumpy. Everyone loves Mario–and for good reason! Taller than his brother. Parts his mustache in the middle. Princess in pink. Rules over the Mushroom Kingdom. The ruler of Sarasaland loves the thrill of the chase. This crude and rude fellow likes to toot...his own horn. Wario’s sidekick and Luigi’s biggest rival (or so he thinks). Mario’s trusty steed from Yoshi’s Island. Has a very sticky tongue. Interstellar observer, protector of the Lumas, and friend to Mario. King of the Koopas. Has monstrous strength and even more monstrous breath. Bowser’s first line of attack. Masked rascal. Always seems to get in the way. Mushroom Kingdom troublemaker. Wears its home on its back. Mischief-making mole. First time as a playable character in the Mario Party series! Bowser’s son. Trouble-maker extraordinaire. Ghost-like enemy who’s even more shy than Shy Guy. Elite member of Bowser’s Koopa Troop. Wears a helmet. Likes to crash through the jungle. Wears a nice tie. Looks harmless but is actually a peanut-popping powerhouse. Falls apart under pressure but is quick to recover. This boomerang-tossing character makes her Mario Party debut as a playable character. Once the criteria has been met, the character appears in the Party Plaza. The player must then talk to the character to unlock them. Complete three different courses in River Survival. Complete Chestnut Forest (World 2) of Challenge Road. Appears randomly after playing different modes. Complete Salty Sea (World 5) of Challenge Road. The main host of the game and one of the three judges, Toad guides players through the game and gives out tutorials to players. He additionally comments on the character's progress in the Party modes frequently and tallies up the results at the end of the game. The secondary hostess of the game, Toadette guards the stars on the boards. Every time a player purchases a star, she moves to another location of the board by traveling on balloons. At the end of the game, she also tallies up the final scoring and comments on the results. A mischievous, but otherwise helpful host that Bowser invites to make the judging "fair" and "impartial", Kamek helps explain various rules alongside his Toadies. He hosts the Bad Luck Spaces and Extra Bad Luck Spaces, while adding hidden variants of them in Partner Party in the middle of the match. When players unlock Toad's Rec Room and Stickers, he removes the obstructing Piranha Plants on the Party Plaza. He is featured as a major obstacle in River Survival if a player goes into the path that contains him. Represented by its head, Flutter owns a shop that players can purchase various items from. In Mario Party, the shop can be accessed by passing by the area; in Partner Party, however, the shop is required to be landed on. If a player passes by his area, Lakitu can enlist his services to steal coins for free or a Star for 30 coins. Koopa Paratroopa can send a player to a rival's space for five coins. It also appears in River Survival taking a snapshot of the four players as they descend down a waterfall, if players pick a path it is on. This snapshot appears at the end of the mode. Super Mario Party contains four boards used in Mario Party and Partner Party mode, sharing the same locations but with a path-based or grid-based layout, respectively. This is also the first Mario Party game since Mario Party 6 not to contain any form of boss battles. Kamek's Tantalizing Tower and Tantalizing Tower Toys are unlockable boards, unlocked by playing the three starter boards of each mode at least once. Can you make it through the perilous Domino Ruins paths? King Bob-omb's court is a high-risk, high-reward place to be. These four little tropical islands feature pipes you can use to warp between them. The cost of Stars Changes?! It's a fierce fight for coins! Talk over how to move the Whomps before taking action. Use the mine-cart Bomb-omb to your advantage. One trick is to split up across different islands. A gleaming board where anything goes! Your teamwork will be put to the test! 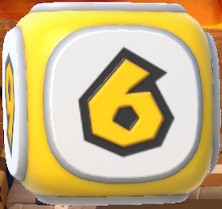 Normal Dice Block: The standard 1-6 Dice Block. Dice Blocks unique to each character that can be used any time they roll. They have the opportunity to increase their maximum number of rolls, affect their coin count, increase the chance of getting a number, or even cause them to get a 0. 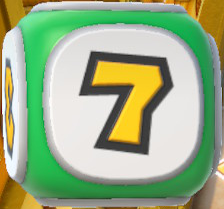 The player can also use a teammate's Dice Block if they have one with them. The following has all of the numbers on each character's Dice Block. Ally Dice Block: Every ally of the player(s) can use an extra Dice Block that can roll from 1-2. 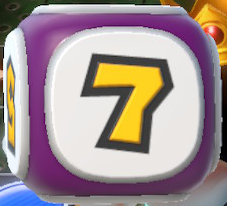 Dice Blocks marked with an asterisk (*) are character Dice Blocks reused from Toad Scramble in Mario Party: Star Rush. In Wario's case, his Dice Block was originally used by Waluigi instead. The Bob-omb appears only in King Bob-omb's Powderkeg Mine (Mario Party) and Gold Rush Mine (Partner Party). When the player passes on the Bob-omb, it follows and temporarily functions as an ally. After the set amount of turns, the Bob-omb goes away by exploding. Golden Drink ("Gain 1 coin each time you move. Can't use this while Peepa is in the way.") - Turns the player golden, akin to the Gold Flower. Coinado ("Steal 5 to 10 coins from rivals.") - Summons a Tornado to attack a rival of the player's choice. Key (Domino Ruins Treasure Hunt, Tantalizing Tower Toys): In Domino Ruins Treasure Hunt, the key can be used to open a treasure chest containing a star. In Tantalizing Tower Toys, it is used to open a gate containing extra coins and spaces. Pickaxe (Gold Rush Mine): Used to break open rocks containing stars. Silver Pick (Watermelon Walkabout): Used on the watermelon island to raise a space up to reach a high platform with a star. Hidden Block, a Gold Block that has a chance to rewarding the player who found it with a Star. A cloud symbol which summons Lakitu to steal coins from a rival for free or give the player a star for 30 coins. A wing symbol, which summons a Koopa Paratroopa that will carry its summoner to a rival's spot for five Coins. A Wiggler symbol, which summons a Flutter who owns an item shop. Start Space - A blank green space where every player starts on the board. Plus Space - Grants three coins to players that land on it. Minus Space - Takes three coins from players that land on it. Event Space ("Landing here could set off a terrifying trap. Or not, but do you really want to risk it?") - A green space with an exclamation mark. VS Space ("Everyone wagers coins before facing off in a VS minigame!") - An orange diamond with the word "VS" on it that acts similar to the Battle Space. Here, everyone plays a rumble minigame after forking over a number of coins determined by roulette. The winner gets a majority of the coins wagered. After the minigame ends, the VS Space turns into a Plus Space. Ally Space ("Call one new ally to join you!") - A green space with a friend icon on it. Item Space ("Pick up helpful items. It never hurts to land here!") - A green space with a mushroom on it. Lucky Space - A green space with a clover on it where the player can win items or coins. Bad Luck Space ("Depending on where the wheel stops, you could lose items or coins.") - A red jagged space with an exclamation and question mark that acts similar to a Bowser Space albeit with Kamek instead of Bowser. Extra Bad Luck Space ("Depending on where the wheel stops, you could lose coins or stars.") - Appearing on the last three turns, all Bad Luck Spaces become dark-red spaces and the events on the wheel are harsher. Super Mario Party has a total of 84 new minigames. Of these, 30 of them are Free-for-All minigames, 10 of them are 2-vs.2 minigames, 10 of them are 1-vs.3 minigames. New categories of minigames introduced are 10 Co-op minigames, where all 4 players work together to beat the minigame; 10 Team minigames, where players form a team of 8 and they all work together against another team; 10 Rhythm minigames, where players get points by performing tasks to the rhythm of a song; and 4 Toad's Rec Room minigames, where players have the option to connect two undocked Nintendo Switch consoles together and play on both of them. Rather than a simple menu, there is now a complete controllable hub world. Character selection now comes before selecting any in-game modes. Practice mode in minigames now take place in the Rules screen itself, instead of being separate. On the rules screen, all players need to press a button to confirm they are ready to start instead of only the first player pressing it, similar to the other Mario Party games since Mario Party 9. In Partner Party, the Dice rolls are shared between the two players. Party Mode now only goes up to 20 turns, and 30 turns on Kamek's boards; previous games have the player decide between 10-50 turns. After a 2 vs. 2 or 1 vs. 3 minigame or in any mode where you compete with teammates, there is a bonus where the player has to high five their teammates to earn bonus coins. Bonus Stars are determined based on turn amount. A 20 turn game gives out the traditional three Bonus Stars; for 10 and 15 turn games, only two Bonus Stars are distributed. In the British English version of the game, pronouns refer to Birdo as a male. The American English and most other variants of the game has Birdo referred as a female. In the French and Chinese versions, Birdo uses ambiguous pronouns. In the British English version, Toadies are named "Magikoopas." In the Simplified Chinese version, some characters' names have been changed to match their Traditional Chinese names, such as Goomba, Koopa Troopa, Boo and Dry Bones. Super Mario Party is developed by Nd Cube and co-developed by CAProduction, the teams primarily responsible for many Mario Party titles, and the game is published by Nintendo. Shuichiro Nishiya, who has directed the most Mario Party installments and has been directing many Mario Party installments since Mario Party 6, reprises his role as the director for the game. Many of the game's directors and chief directors have worked on a Mario Party installment prior to Super Mario Party, such as music director, Chamy Ishi, who has worked on directing music for Mario Party installments since Mario Party 9. Super Mario Party has been met with generally positive reviews, garnering an average of 76 based off 78 reviews on Metacritic and a 74.59% based off 33 reviews on GameRankings, notably receiving more praise than most Mario Party games in the series, being second only to the original Mario Party title for the Nintendo 64. Critics have generally praised the return to the original method of playing the game's main mode, blended with elements new to the series, as well as the amount of minigames and modes, in addition to the party experience with multiple players. Critics have compared the game favorably to the recent past installments of the Mario Party series. Much of the criticism has been directed at the number of boards, the board design, CPU intelligence, the single player experience, and the online implementation. Casey Gibson of Nintendo World Report gave Super Mario Party an 8/10, praising this direction of the Mario Party series favorably compared to the Mario Party titles where "everyone was placed in the same vehicle, which would then move around the board at the same time." While Gibson has noted that the time can feel "drawn out" while playing with computer players, it was noted that the pacing can feel better than played with friends. Gibson has additionally praised the assortment of the 80 minigames where they are "actually a ton of fun and are pulled off very well", citing Sizzling Stakes as one of the favorite minigames played. The most jarring criticism from Gibson has been directed towards the online play and its features and options (opined as restrictive), such as its rotation of 10 minigames, where she summarizes, "Overall, although the mode is fun, it won’t likely see much playtime as you repeat the same few games over and over. It’s a tease of what could be, but ultimately fails to add much value to the overall package." Colette from My Nintendo News gave the game an 8/10, echoing sentiments from Gibson, citing the previously released Mario Party: The Top 100 and Mario Party 10 as disappointing, as well as stating "the less said about Mario Party: Island Tour (2013), the better", while praising Super Mario Party in comparison, saying it "changes the sour flow into something much sweeter." Colette has cited opined frustrating minigames such as the CPU players in Pull It Together in the Challenge Road, but has otherwise mostly praised minigames seen as fun. Colette additionally criticizes the online functionality (opining it to be disappointing), although she did note that Super Mario Party was the first Mario Party game to feature online play. Samuel Claiborn of IGN scored Super Mario Party a 7.3/10, calling the game, "the best Party in two [home] console generations." He has praised the game for a perceived sense of being competitive, strategic, and fun, especially in Partner Party. However, Claiborn has cited the other modes not Mario Party or Partner Party as "filler", preferring the focus on the aforementioned two modes. He has also called the amount of boards lacking and that "Parties will get stale fast" due to the opined low number of boards and their believed simplicity, comparing unfavorably to Mario Party 5 and Mario Party 6. Claiborn has also described motion controls and the Joy-Con-exclusive functionality as troublesome, but not "as bad as the worst Wii-era games." Additionally, Claiborn has described the Switch functionality to interact with another console as cramped and "not put to great use". The amount of minigames have been praised as well as the opined attention paid to detail in the minigames. He ended his review with the statement, "Super Mario Party delivers the couch multiplayer experience the series is famous for with an awesome new layer of strategy, 80 mostly-great minigames, and the quirky tech of the Switch controllers to keep things feeling fresh. The downside is that with the Switch’s controllers come some annoyances that make getting people settled onto your couch a bit more of a hassle than previous parties, and the best games are prone to annoying random upsets. But it’s far better paced than recent games and Super Mario Party reset my expectations of the series with its graphics and gameplay creativity." Stefan L. of TheSixthAxis has given the game a 6/10, criticizing an opined safe approach to gameplay, the online implementation, the lack of single-player handheld mode compatibility, the amount of boards, and the amount of minigames for some modes, while praising the return to the original style of play, the strategy of character die, Toad's Rec Room minigames, and the HD Rumble tune. Stephan has noted that the content is "spread wide, but it’s not very deep", and opined that the available boards are not engaging. Stephan has criticized the game's AI, calling them "dumber than a sack of bricks at crucial moments." In the conclusion, he stated that "Super Mario Party is just a very safe game. It brings back the classic Mario Party board game form, marrying it with some of the better ideas from Mario Party: Star Rush, but it’s light on the number of boards to play, lacks depth in other game modes, and misses opportunities for solo handheld and online multiplayer. It’s Mario Party, but it’s not particularly super." Nintendo Switch Becca S., GameSpew 9/10 "Super Mario Party manages to perfectly blend nostalgia with brand new gameplay, and no party’s going to be complete without it." Nintendo World Report 8.5/10 "Mario Party has seen its fair share of good and bad over the years, but Super Mario Party swings the pendulum back in the right direction. The return of the classic style is a welcome one, and the plethora of different minigames hit the mark more often than not. It would have been nice to see another board or two, but the assortment of other fully-fledged modes helps to mitigate that feeling." My Nintendo News 8.5/10 "With impressive aesthetics and delightful character animations, Nd Cube has finally found its rhythm with Super Mario Party. Although the game isn’t without its issues, these are few and far between, making the eleventh instalment one of the best it has been in years." Nintendo Switch Ryan Janes, Nintendo Insider 8/10 "Super Mario Party manages to get the series back on track in a big way, it’s selection of modes engaging, mini-games exciting and overall sense of fun high. While not every idea is a winner, it nails what fans have been after for many years while also injecting a few new twists of its own." Nintendo Life 8/10 "This isn’t a cash-grab with Mario's face on the front; this is a well-constructed and beautifully realised Mario Party game which takes the series right back to its roots, but without being a straightforward rehash. There are a few interesting ideas that feel a little bit underdeveloped, but on the whole Super Mario Party is a true return to form." Nintendo Switch Samuel Claiborn, IGN 7.3/10 "Super Mario Party delivers the couch multiplayer experience the series is famous for with an awesome new layer of strategy, 80 mostly-great minigames, and the quirky tech of the Switch controllers to keep things feeling fresh. The downside is that with the Switch’s controllers come some annoyances that make getting people settled onto your couch a bit more of a hassle than previous parties, and certain minigames are prone to annoying random upsets." Game Informer 7.3/10 "Despite lackluster board design and side modes that can become repetitive, Super Mario Party is a fun group game that showcases a diverse collection of minigames." Nintendo Switch Jordan Ramée, GameSpot 7/10 "Most of Super Mario Party's varied assortment of 80 minigames are fun, especially if you've got a full group of four players, as the NPCs aren't smart or skilled enough to pose much of a challenge until you unlock Master difficulty. The new Partner Party, River Survival, and Sound Stage modes add enjoyable alternatives to Mario Party mode--which at least returns to its competitive roots. And even if the unique character dice blocks don't shake up Super Mario Party's four boards enough to give Mario Party mode some longevity, they implement small moments of strategy into a series that has for too long solely relied on randomness to determine a winner." Nintendo Switch Stefan L, TheSixthAxis 6/10 "Super Mario Party is just a very safe game. It brings back the classic Mario Party board game form, marrying it with some of the better ideas from Mario Party: Star Rush, but it's light on the number of boards to play, lacks depth in other game modes, and misses opportunities for solo handheld and online multiplayer. It's Mario Party, but it's not particularly super. " Within the first two days of launch, the game dominated Japanese sales charts, selling 142,868 copies and beating out competitors such as Assassin's Creed Odyssey for top chart. As of December 31, 2018, Super Mario Party ranks 7th place among the top sellers for Nintendo Switch games, selling at a 5.3 million copies. In King Bob-omb's Powderkeg Mine, if the player uses a Golden Pipe while at the Blue Space directly in front of King Bob-omb, the pipe will clip through the countdown timer. For this subject's image gallery, see Gallery:Super Mario Party. Super Mario Bros.: Mario's, Goomba's, Spiny's, Cheep Cheep's, and Bowser's sprites appear in Puzzle Hustle. Dart Gallery's background features neon lights resembling the overworld levels from this game. Super Mario Bros. 2: Shy Guy's sprite appears in Puzzle Hustle. Super Mario World: Luigi's, Boo's, Koopa Troopa's, Monty Mole's, Dry Bones', Kamek's, Sumo Bro. 's, Chargin' Chuck's, Mario with Baby Yoshi, and Cape Mario's sprites appear in Puzzle Hustle. Mario Party series: In one of Birdo's dialogue lines, she refers to this game as the "11th party", referencing the previous ten home console Mario Party games. She also gives the player quizzes relating to the previous home console Mario Party games. Mario Party: The game's opening is a direct callback to this game's opening, with Mario and his friends arguing over who is the Super Star. The opening also begins from a similar camera angle. Mario Party 2: The music for Shell Shocked Deluxe is an arrangement of the music "Going for the Coins", which is used in several minigames, one of which is Shell Shocked. Mario Party 7: In Mario Party Mode, whoever rolls first becomes a red player, second is blue, third is green, and fourth is yellow, regardless of player number. Mario Party DS: The Star Pipe item returns under the name "Golden Pipe". New Super Mario Bros. Wii, 2, and U: In Challenge Mode, the sound effect that plays when a new level opens up is recycled from these games. Mario Party 9: Shy Guy's and Koopa Troopa's victory and losing animations are recycled from this game. Mario Party: Island Tour: Bowser Jr.'s and Boo's victory and losing animations are recycled from this game. Mario Party 10: The majority of the returning characters' victory and losing animations are recycled from this game. Super Mario Maker: Peach's, Daisy's, Wario's, Waluigi's, Yoshi's, Rosalina's, Donkey Kong's, Diddy Kong's, and Toad's Costume Mario sprites and Chain Chomp's (Super Mario Bros.-style), Blooper's (Super Mario World-style), Hammer Bro's (Super Mario World-style), and Bowser Jr.'s (Super Mario World-style) sprites appear in Puzzle Hustle. Mario Party: Star Rush: Diddy Kong's victory and losing animations are recycled from this game. The concept of character-specific Dice Blocks returns, with some Dice Blocks being reused (albeit with different names). The Coinado item returns. Bob-omb's role in Gold Rush Mine is similar to Peepa's role in this game, where both characters will join as "allies" and roll a negative Dice Block. Mario Sports Superstars: The horses in Fiddler on the Hoof reuse their Balance-type design from this game. Super Smash Bros. Ultimate: Mario's Dice Block and River Survival appear as spirits, originally only obtainable during the "Oh Yeah! Mario Time!" spirit event that ran from December 27, 2018 to January 1, 2019 prior to the version 2.0.0 update. This is one of two Mario Party games to not feature a Bowser-themed board, the other one being Mario Party 3. This is the first Mario Party game since the fifth installment where the announcer is female. ↑ Australian Government (June 21, 2018).Super Mario Party. Australian Classification Board. Retrieved June 22, 2018. ↑ 編集部 Ike (June 13, 2018). サイコロの目が0！？ Nintendo Switch『スーパー マリオパーティ』で進化したスゴロクや新しいプレイスタイルを楽しもう！. Nintendo.co.jp. Retrieved June 13, 2018. ↑ 3.0 3.1 3.2 3.3 3.4 Nintendo (June 12, 2018). Super Mario Party. Nintendo at E3 2018. Retrieved June 12, 2018. ↑ Nintendo UK. (June 13, 2018). Nintendo smashes E3 with 2018 line-up, details about Super Smash Bros. Ultimate. Nintendo.co.uk. Retrieved June 13, 2018. ↑ Nintendo Australia. (June 13, 2018). Nintendo smashes E3 with 2018 line-up, details about Super Smash Bros. Ultimate!. Nintendo.com.au. Retrieved June 13, 2018. ↑ Nintendo of Korea. (June 13, 2018). 한국닌텐도, 「슈퍼 스매시브라더스 얼티밋」의 발매일을 포함한 새로운 정보 및 「슈퍼 마리오 파티」「Fire Emblem(가칭)」의 한국어 대응 발매를 발표. Nintendo.co.kr. Retrieved September 14, 2018. ↑ Nintendo HK. (June 13, 2018). Nintendo HK E3 press release. Nintendo.com.hk. Retrieved June 13, 2018. ↑ Nintendo Taiwan. (June 13, 2018). Nintendo Taiwan E3 press release. Nintendo.tw. Retrieved June 14, 2018. ↑ 10.0 10.1 10.2 10.3 10.4 10.5 10.6 10.7 10.8 BeardBear. (October 3, 2018). Super Mario Party - All Cutscenes YouTube. Retrieved October 4, 2018. ↑ Emma Kent. (August 24, 2018)Super Mario Party's use of two Switch screens is a technological marvel Eurogamer. Retrieved September 4, 2018. ↑ Metacritic score for Super Mario Party. Metacritic. Retrieved October 10, 2018. ↑ GameRankings score for Super Mario Party. GameRankings. Retrieved October 10, 2018. ↑ Gibson, Casey. (October 3, 2018) Super Mario Party (Switch) Review. Nintendo World Report. Retrieved October 10, 2018. ↑ Colette. (October 3, 2018) Review: Super Mario Party For Nintendo Switch. My Nintendo News. Retrieved October 10, 2018. ↑ Samuel Claiborn (3 Oct 2018) Super Mario Party Review. IGN. Retrieved October 10, 2018. ↑ Stefan L. (October 3, 2018) Super Mario Party Review. TheSixthAxis. Retrieved October 10, 2018. ↑ Lamoreux, Ben. (October 10 2018) Super Mario Party Dominates the Japanese Charts at Launch Gamnesia. Retrieved March 15, 2019. ↑ (December 31, 2018) IR Information: Sales Data - Top Selling Title Sales Units Nintendo. Retrieved March 15, 2019. ↑ Lamoreux, Ben (January 31, 2019) Super Mario Party Hits 5 Million Sales Gamnesia. Retrieved March 15, 2019. This page was last edited on April 18, 2019, at 13:51.